From 12 - ski over to main and. ride up Broadway Express and ski down Stump Alley. Ride up Gold Rush Express and then ski back to Canyons and take the Gondi home. Thanks Pat this is great! socalgal and Pat AKA mustski like this. Every time I look at the forecast it gets bigger and Bigger and BIGGER !!! Pat AKA mustski, luliski, socalgal and 2 others like this. Well, we are up here. Today was a great ski day. Chalky snow everywhere. No lift lines. Upper mountain had a lot of wind driven on top of ice. Clouds started coming in around 3.30pm. We are snugged up in a cabin now, waiting to see what tomorrow will bring. moreoutdoorYuri, MountainMonster, Pat AKA mustski and 1 other person like this. IT GOT *B I G G E R* AGAIN !!! Pat AKA mustski, MountainMonster and Rostapher like this. We booked an additional night. Staying till Tuesday now. luliski, dbostedo, MountainMonster and 4 others like this. @river-z are you at Mammoth this weekend too or are you skiing vicariously like I usually do? I’m skiing vicariously now but glad of accumulation for later. Plus, weather like this is amazing. I’ll be at Snow Summit next week. Pat AKA mustski and Rostapher like this. Have fun everybody! BTW- your welcome. SoCal ALWAYS gets a big snow dump when I travel elsewhere to ski. I'm already booked and headin up on Thursday! EDIT: BUT.... chr 22 open & expecting chr 25 - Lincoln should be awesome the next few days! luliski and socalgal like this. Its. Epic. So much snow! The snow drifts are bigger than my kiddo. Might have to rent some demos tomorrow or Monday. Pat AKA mustski and luliski like this. 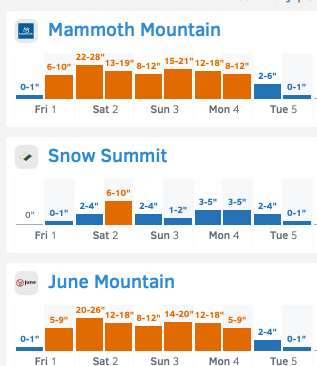 I was scrolling through my list of favorite mountains in OpenSnow yesterday and was flabbergasted to see over 100" forecast over the next 5 days at Mammoth. Holy cow! 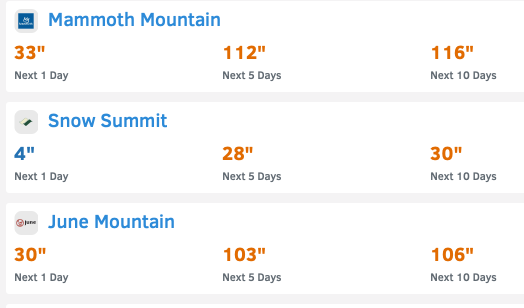 Right now, it looks like Mammoth has received 23" in the last 24 hours with 117" forecast over the next 5 days. Absolutely incredible! If all of that snow falls as predicted, it's going to push the snowpack way above average for this time during the season ! I can't wait to see pictures from those of you lucky enough to get to ski this. 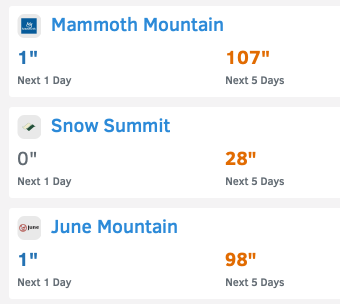 I have a question for those of you with experience spring skiing at Mammoth: would it be crazy for me to consider skiing during Memorial day weekend at Mammoth? I've heard that the spring skiing is legendary and unrivaled. Looking at the last 10 years of Mammoth closing dates, it looks like they've always been able to at least stay open through the end of Memorial day weekend. Some years they stay open way past Memorial day. I suppose it's probably much too early to predict how long the snowpack will last, but this big storm happening right now is making me hope that this will end up being a very good year for Mammoth and the Sierras! The skiing at Mammoth Mountain in the spring and summer is phenomenal! It’s so reliably good that they have dozens of camps, clinics and races planned into June every year. In 2017 Memorial Day was more like the middle of season, the lifts ran well into August and the skiing was still good after they closed! Anecdotally, this winter feels like a big one. Decent well spaced storms without long warm stretches. Wind events stripped some of the ridges of snow early season but this storm seems less windy. I expect great, deep coverage everywhere by the end of the week that will almost guarantee skiing on Memorial Day if not the Fourth of July. socalgal and RJS like this. Last I heard the 395 is closed at the 203. So, are y’all snowed in? It looks like it's just chain controled. I'm not seeing anything about a closure on CalTrans. The Caltrans website is reporting sections of R2 on 395 and R1 on 203 which is a little strange. Maybe there’s an accident or something. This is a nice storm and there’s snow on the roads but it’s not an “all hell is breaking loose, protect your own” event. At least not yet it isn’t, there’s still hope. Pat AKA mustski and RJS like this. Unfortunately, sickness has struck and we are headed back home. Hoping to make it by kickoff at least. Drat! Maybe there is still hope! It's a terrible thing to get snowed in at Mammoth! Rostapher, socalgal and MountainMonster like this.